A detailed examination of the 1895 photograph will uncover several early items that have survived various renovations, although they have moved. To the right of the altar, above the cloth covered credence table, on the chancel wall, is a memorial plaque. Its inscription also indicates that it was intended to be near the main altar. Today it is to the right of the entrance of the Chapel. 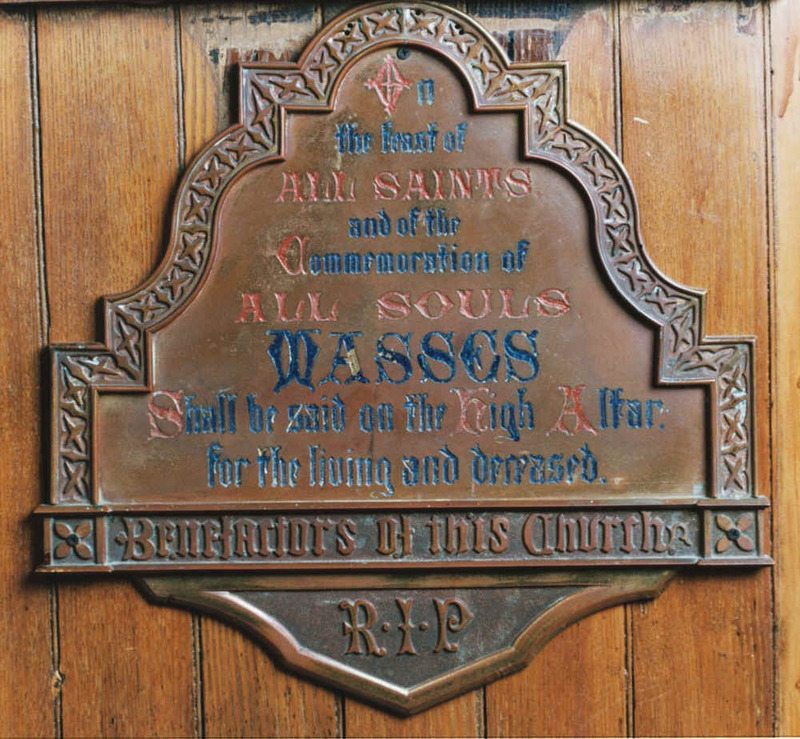 "On the Feast of All Saints and of the Commemor ation of All Souls Masses Shall be said on the High Altar for the living and deceased Benefactors of this Chapel R.I.P." To the left of the altar of St. Joseph, another plaque is visible. Today, it also is to the right of the Chapel entrance. Its inscription even more clearly indicates its original location. 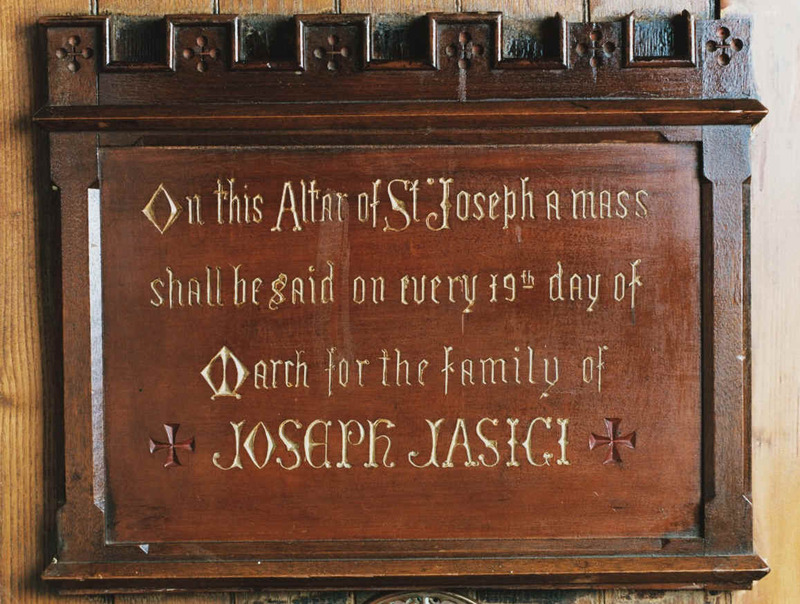 "On this Altar of St. Joseph a mass shall be said on every 19th day of March for the family of Joseph Jasici." On the left of the chancel are carved wood chairs. They seem to have moved quite a bit. In 1928, they were in the entrance foyer of Presidents Hall. Today they are in the Seminary. Another fixture of the early Chapel remains, in part. 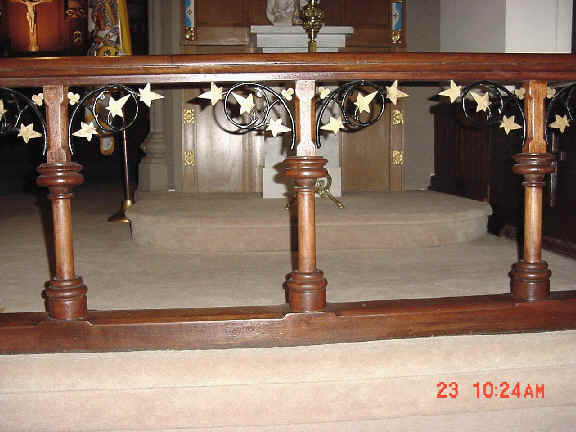 The altar rail, composed of a wood hand rest set on wood pillars, and decorated with wrought iron leaves and vines, is still in place. Originally the altar rail had hooks on the chancel side that held a linen cloth that was placed over the hand rest during Communion. The ends of the pews remain in place. On each is a number. 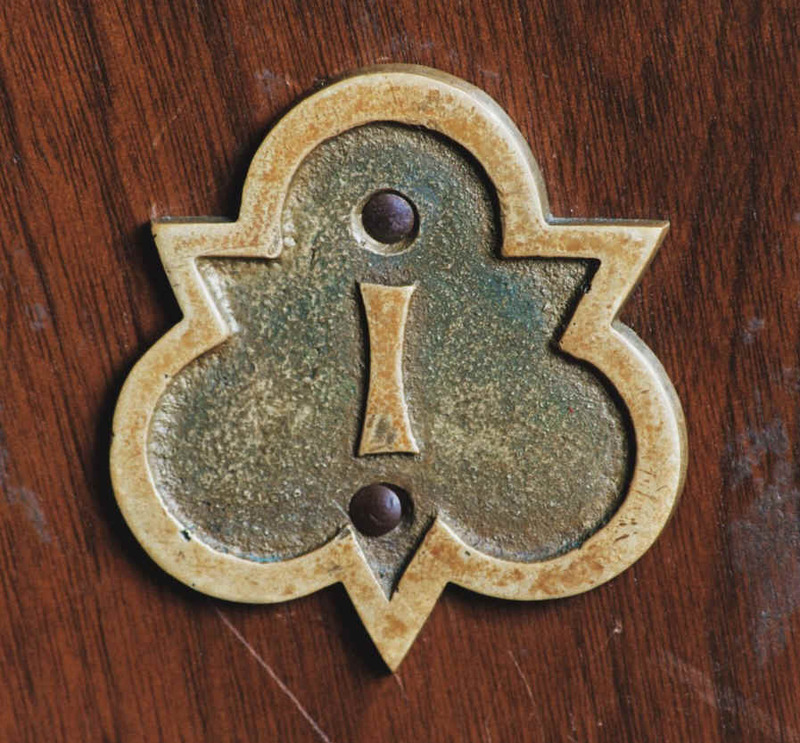 In parishes pews were numbered and assigned to families who paid "pew rent." Here the numbers were probably to assign seats to the seminary and college students. The front hand rest remains as well. 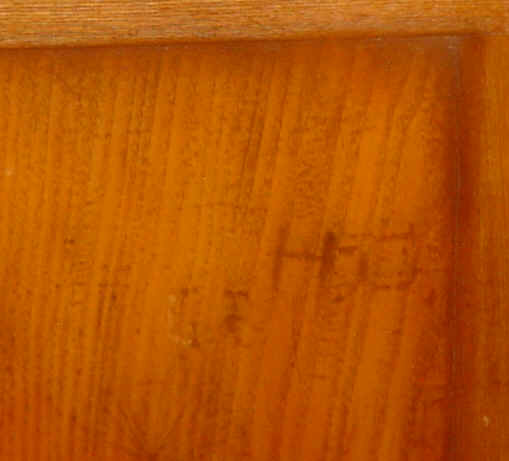 A careful examination will reveal the remains of carved initials, a reminder of students of the past. When the seats of the pews were replaced, the carvings unfortunately were sanded into obscurity. Although not visible in the 1895 photograph, a very poignant Chapel appointment was in place in the nineteenth century. This unusual funerary monument, in the form of a coffin, is on the right wall of the nave. 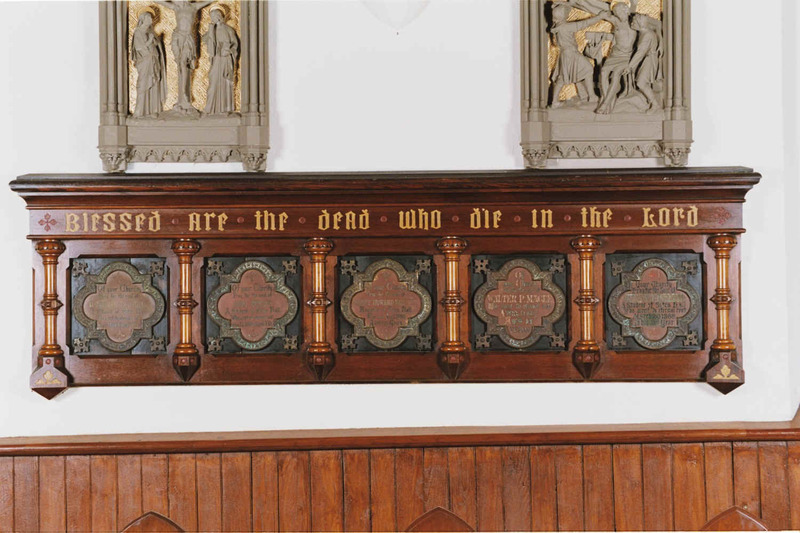 It contains five memorial plaques, four for students who died in the 1860s and one for the college registrar. "Of your Charity, Pray for the soul of B. Amadee Berthold, A Student of Seton Hall, Who went to eternal rest, Sep.6, 1861, Aged 14 Yrs." "Of your charity, Pray for the soul of John Butler, A Student of Seton Hall, Who went to his eternal rest, Sept. 11, 1865, aged 14 years." "Of your charity, Pray for the soul of Henry Howard Burgess, Registrar of Seton Hall, Who died Aug. 1, 1866, Aged 66 years." "Of your charity, Pray for the soul of Walter P. Magee, Who went to eternal rest, April 6, 1867, Aged 14 years." "Of your charity, Pray for the soul of James H. Farrell, A Student of Seton Hall, Who went to eternal rest, March 20, 1868, In his 13th year." This memorial reminds us of the fragility of life, of the death by disease of many youth in the nineteenth century, and of the composition of the student body in the early days of the college. Until the twentieth century, there was no formal distinction between "high school" and "college" education.